Kettle Falls Nra Campground Rd. Ask fellow campers about "Lake Roosevelt National Recreation Area-Kettle Falls" and nearby attractions. We camped in a first come first served spot and arrived in time to score a spot right on the lake. We loved the view, we had plenty of sun for our solar panels, and we enjoyed exploring the area. The little trail to the water is just a dirt slide, and there really aren't any beaches because it's a reservoir, but there was a little swimming beach and raft at the marina just a short walk away. There were lots of small boats coming and going from the marina next door, but at sunset all quieted down. Lots of mosquitoes so be prepared, and the roads in the park could be challenging for big rigs due to the tight corners and close trees, but everyone seemed to manage without a problem. We'd return to this park, next time with a way to get out on the lake! We camped at Lake Roosevelt National Recreation Area-Kettle Falls in a Travel Trailer. Nice campground above Roosevelt Lake with nice view. Far enough from the highway to get a good nights sleep. Sites are dirt/gravel and mostly level. Privacy is lacking as there are only a few trees on the entire campground. Dump station on the way in/out. Rate is after 50% Interagency Pass discount. 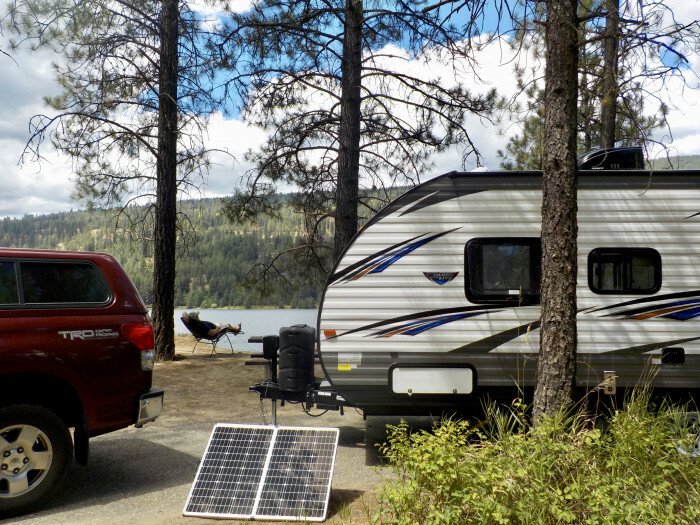 We camped at Lake Roosevelt National Recreation Area-Kettle Falls in a Truck Camper. Have stayed here several times in the past and found the price increased this year to $18 [$9 with geezer pass]. Fairly busy on weekends but not full. Hardly anyone there during the week. There are three loops, some sites on the lake. Some are reservable and some are first-come-first-served. The Verizon signal there is great and there is a good walking trail several miles long. The hosts here are very nice and helpful. Lots of smoke due to area wildfires [no campfires permitted] and the campground closed while I was there because of fire danger and we had to evacuate, including the hosts. I will return next year. We camped at Lake Roosevelt National Recreation Area-Kettle Falls in a Motorhome. Right next to the Kettle Falls Marina. Nice park, well managed. Although there are sites adequate for big rigs, the thick trees make it a little challenging for some, as I observed. My 24' Class C was fine, however. Dry camping, good cellular signal. Nearby forest fires caused a heavy blanket of smoke during my stay but it did not hinder my enjoyment of the experience. The price reflects my America the Beautiful senior pass. Will definitely visit here again. We camped at Lake Roosevelt National Recreation Area-Kettle Falls in a Motorhome. Dry camping, reservations available but if you don't care where you camp probably not necessary as many spaces are available even on the weekends. This campground is mostly used by boaters who bring their RV for the evening and Canadians who like the cheap price. Bathrooms were old but clean, no showers. Most sites are pull-through but like another reviewer said, lots of trees make the spaces tight. Most are slightly off-level but not by much. If you like privacy the 50 series sites are tucked far in the back. Water sites are really nice but there is about a 6 foot drop to the water and no beaches. There was a sign that warned of "swimmer's itch" a parasite that borrows under the skin and causes allergic reactions in some, so if you do go into the water, rinse off!! Also bring mosquito repellent as they were hungry. A nice trail runs south of the campground from the dump station and also a small store/cafe is at the boat dock. Dump site also has a fresh potable water spigot. We camped at Lake Roosevelt National Recreation Area-Kettle Falls in a Motorhome. If you are looking for an inexpensive down-to-basics campground, Kettle Falls Campground is it. Located right next to Lake Roosevelt, you can have a site "on the lake". But you are up above the water by several feet and will have to climb down a steep bank to get to it! It is still a beautiful setting though with lots of pine trees for shade, clean bathrooms with flushing toilets (just no showers), and a very nice boat launch/marina for boat lovers. Sites are all paved, but not overly long, and the pull-through sites are narrow and tight. Next time we go we will pick a back-in site over a pull-through. A swimming beach is advertised on the website, but that encompasses the entire Lake Roosevelt Area. There is NO swimming beach at this campground. 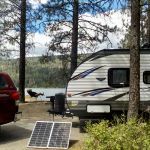 We camped at Lake Roosevelt National Recreation Area-Kettle Falls in a Travel Trailer. Are you affiliated with Lake Roosevelt National Recreation Area-Kettle Falls ?